Wheaton based campaign consultants Reverse Spin LLC are now players in Lake County politics, as the campaign committee of Mark Curran recently contracted their services for $2500. Among Reverse Spin's former clients are GOP candidate for Illinois Attorney General & Lieutenant Governor, Joe Birkett; also former Illinois Attorney General and GOP candidate for Governor, Jim Ryan. Curran's term as Lake County Sheriff ends in 2014; it is widely speculated that Sheriff Curran will hang up his stetson & spurs to run for a higher office. One does not send a down payment of $2500 to connected GOP consultants like Reverse Spin to run for County Dogcatcher Sheriff. There are additional signs that Curran plans to flip-flop from being a County Sheriff to a post higher up the food chain. 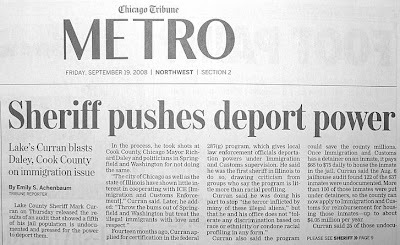 Friday, Lake County Sheriff Mark Curran popped back in the news on the illegal alien front. Pointing out that 20% of those in his jail were illegals, he complained that he did not yet have the power to send them to ICE for deportation. He applied for such authority 14 months ago, the first Illinois sheriff to do so. He said shipping them out would save over $4 million a year, according the the Chicago Tribune. Betraying one's Teaparty base for an opportunity instead to carry agua for the elefante is not a campaign strategy to get re-elected to Sheriff in Lake County. It is however smart politics if the goal is to run state-wide. The consensus among the uninformed sources is that Mark Curran 2.0 will not be seeking re-election to the post of County Sheriff in 2014. Those same uninformed sources are divided, however, over which particular state-wide office is in Curran's sights.